This healing system of the Usui Reiki Ryoho Gakkai (gakkai = learning society) grew out of the original teachings of Mikao Usui, a Japanese man, around 1926. Usui had called his spiritual development system "My Method" or Usui-no-Michi. In the West, it was previously thought that it was his purpose to find out how famous healers like Buddha and Christ healed the sick, without depleting their own inner energy. However we now know that he was a Tendai Buddhist lay monk, who had developed powerful healing energies as a by-product of his own spiritual development over many decades. During his life he studied old religions and ancient teachings including forms of Zen Buddhism and Taoism. He was also a practitioner of martial arts, a member of a warrior group of monks and knew some of influential martial arts teachers of his time. The organisation that survived him, Usui Reiki Ryoho Gakkai, teaches that he experienced a very powerful personal energy (a forerunner to what we now call Reiki) during one of his traditional 3 week fasts, this one on the Holy Mountain of Kurama Yama, just north of Kyoto Japan. The experience apparently revealed to him his life purpose and as a by-product, the bonus of a much stronger personal ki or energy and an amazing healing ability. In Kyoto around 1914, Usui Sensei began teaching aspects of several spiritual systems that he felt could be more easily accepted and understood by the average lay person. In 1922 he moved his family to Tokyo along with his dojo or training hall, and formalised his system into 13 levels. However, during classes, many students found they were beginning to resonate to Usui's own strong personal energy or ki, simply by being near to him or touching his robe. He may have become known as a powerful healer due to his assistance with victims of the 1923 Kanto earthquake. As he had a family to support, students paid dues and for extra income he rented out the dojo hall in the evenings to those who wished to lecture. In 1923, one of Usui's senior Kyoto students, Toshihiro Eguchi, moved to Tokyo, joined the dojo and rented it twice a week. He used this opportunity to teach revised versions of Usui's methods, which were usually approved of by Usui. By 1925 Eguchi was also curious about Usui's natural healing abilities enough to explore his own potential in his evening sessions. Near the end of the year, a large group of navy personnel led by 2 retired admirals joined the dojo, and during Eguchi's lectures encouraged him to develop a healing system. Eguchi took ideas and hints from Usui's classes and by mid January 1926, a system was born under the heading of Usui Reiki Ryoho Gakkai (learning society). Usui passed away shortly afterwards and the dojo was moved to the clinic of Usui student Chuujuro Hayashi. World War 2 disrupted the Gakkai's teachings but prior to that, in 1935 a Japanese Hawaiian named Hawayo Takata studied under Hayashi and brought his evolving Reiki system to Hawaii. In 1975 Mrs. Takata finally began teaching in mainland USA, and the following year in Western Canada. The modern concept of Reiki spread quickly from there. The word Reiki in its original kanji form is actually a term that Usui used in defining a set of concepts for his original system. According to Hayashi student Tatsumi-san, he was attributing the source of his abilities and inspiration to his ancestors. In 1980's Western translation methods however, the word Reiki was seen as being made up of two Japanese words - Rei and Ki. Literally, taken one word at a time, Rei can mean supernatural force or spiritual intelligence; Ki can mean life energy. Thus Reiki is often described in the West as "spiritually guided life force energy." However, this is like taking the meaning of the French words "chat" - cat, and "eau" - water, to understand the word "chateau" - castle. In Japanese, as in many languages, words must be taken together in phrases and in the context of their use, in order to understand their actual meaning and intention. Returning to the URR Gakkai, Usui's original ideas and experiences were trimmed in some ways, and expanded and modified in others by his students, into a palm or hand healing system. The background for this page contains these 6 kanji characters for "Usui Reiki Ryoho" in Usui's handwriting. 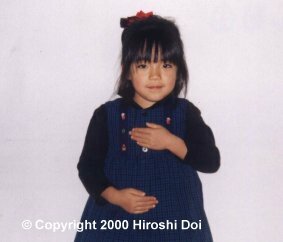 The original system of Usui-no-Michi is still being taught, due mainly to the fact that as of the end of 2002 there were still a handful of Usui Sensei's students still alive in Japan. These people communicated their knowledge and understandings of Usui's original spiritual teachings to some Western students, who have since shared this with the West.. However, since it is highly personal and spiritually oriented, most people seem to begin with the study of Reiki, a much simpler process. As each colour in the rainbow is actually a different frequency or vibration of white light, the Reiki energy can be considered a range of vibrations of the Universal Energy or The Light, but perhaps a range that is beyond the normal access of each individual. Yet itt is well known for it's ability to bring the human energy field into balance on all levels, thus encouraging and speeding up the natural healing process - in the area of body, emotions, mind and spiritual. What is a treatment or session like? A standard Reiki treatment usually includes placing the hands above, or on, the head, shoulders, stomach, abdomen and feet. In addition, other positions may be used for specific conditions the client may have. Each position is held 2 to 5 minutes and the entire treatment can last 30 to 90 minutes. Originally the Reiki practitioner would have placed his/her hands on a few places on the head, then worked on the places of illness or injury, all while the patient sat on the floor or lay on a futon. A treatment creates a wonderful radiance that is deeply relaxing and includes many beneficial affects for both client and practitioner. At the very least, you will feel very relaxed during a session, often to the point of falling asleep. A Reiki session always seems to impress those who say they find it difficult to relax. As a Reiki practitioner, you can also treat yourself by placing your hands on yourself. Reiki will flow into you and begin its healing work. As in other forms of energy healing, a Reiki practitioner can also "send" a treatment to another person who is not in the same room or location. This is usually called Distant Reiki. What can be treated or helped? In oriental cultures, healing disciplines like Reiki may be applied to healthy people as a preventative method. However, Reiki may also be used to assist you in returning to a state of health. Reiki is both powerful and gentle. In its long history of use Reiki has aided in healing virtually every known illness and injury including serious problems like cancer and heart disease as well as skin problems, cuts, broken bones, headaches, colds, sunburn, insect bites, insomnia, lack of confidence, etc. Reiki can also be used to relieve stress, to overcome unwanted habits, to achieve desired goals, and to protect from harm. Many Reiki practitioners have found that plants and animals also respond well to a Reiki session. The ability to use Reiki by the student is assisted by the Reiki Master via an empowerment within an attunement process or ceremony. It is like a re-awakening of a talent that is laying dormant within you. For some, it may be possible to re-activate this ability on their own, although usually it is to what I would call their own Highest Ki. But for most, it is far simpler to receive a Reiki attunement. Because of this, virtually anyone can learn Reiki with no prior experience or ability necessary. The attunement process can cause chakras to open and create a special link between the student and the Reiki source. The Reiki Master then explains and demonstrates its use. After that, the student simply places her or his hands on someone with the intention of healing and the Reiki energies will automatically flow through the student towards the recipient. Because of this unique attunement process, Reiki can be easily taught during a one day class, or less. The Reiki Empowerment is actually a powerful healing experience in itself. Children can easily acquire this ability, even small children. Since no focus or concentration is required, they can even watch TV, read a book, talk, etc. while giving a very effective Reiki session. I have found that I could encourage my own young children to give me a Reiki session while they watched their favourite TV program or video. Their energy was always strong and constant. I simply moved their hands to different positions when I felt they had been in one place long enough, or they felt to hot for me <smile>. Reiki is an amazing energy that originates with the highest spiritual source. It seems to know where to go and what to do. It is multi-dimensional and will affect the cause of a problem on whatever level it may exist - body, mind, or spirit. It does not have to be directed by the practitioner. . Because it is a vibrational radiance (much like playing music), the Reiki practitioner's energies are never depleted. In fact, when giving a treatment, the Reiki practitioner is affected as well and always experiences an increase in their own energy. People that already do healing work report their healing energies increase dramatically after receiving Reiki training. Consider whenever a person goes outside to water the garden. She or he turns on the water tap, picks up the hose and focuses the nozzle of the hose towards the garden. The person isn't usually concerned with the water running out, nor with the possibility of anything foreign coming in through the sides of the hose. The person also doesn't worry about anything coming back up through the nozzle as the water pressure is too strong. While this person could just let the water run and it would work its way to all parts of the garden, she or he likes to direct the water to her/his favourite plants, then possibly to the balance of the garden. However, if there is a part that is in greater need than the rest of the garden (like a very large vegetable), the water will be drawn more strongly to here, so as to balance the entire garden's water content. And it is usually quite obvious where these spots are, as more water gets absorbed here, than elsewhere. The water can be thought of as the Reiki energy. It comes from a source that you begin to resnonate, and seems to have no limit to its availability. The person is the Reiki practitioner. The hose is like the purified Reiki channel that is opened within the initiated Reiki practitioner. It is very pure and strong and nothing can penetrate it; i.e. your energy does not get mixed with the Reiki energy before it leaves you. The energy flows out the palms of your hands, your nozzles (as well as other chakras in the body), and the recipient's energy does not flow back into the practitioner (so you don't take on their mis-qualified energy). The Reiki practitioner can just stay in one place projecting the energy on or towards the person who is receiving it, but typically moves around the body, starting with the recipient's head (just like watering the favourite flowers first). While the Reiki energy fills and surrounds the recipient's body with its gentle vibrations, if there are parts that require more balancing of energy (called energy blocks), the Reiki energy will focus more in those places. The potential end result is a balancing of all the energy in the body, plus in the other levels of the aura. So in this way Reiki spreads into the emotional, mental and spiritual areas as well. The Reiki process can also be thought of being similar to a sprinkler hose with little holes all around the sides of it. Like the sprinkler hose, the Reiki also "leaks" out into the Reiki practitioner, causing her/him to receive a gentle Reiki session also. The result of this latter fact is that the Reiki practitioner feels energized and vibrant after giving a Reiki session, and is quite capable of performing several sessions in a row. Am I Already Using Reiki? I often get comments like this one - "What you describe here sounds very much like an ability I have been using for some time. Am I already using Reiki?" This may come from students or from people over the internet. Some of them have been born with healing abilities, while others have learned similar energy techniques. First of all, what I qualify as "Reiki" would be the same quality of energy that Mikao Usui resonated automatically. This implies that a person has received the energy in a way that Usui's students used to pass it on to their students; that is, by way of an energy empowerment, usually given in a Reiki class, by a Reiki teacher. Perhaps it would be more appropriate to discuss whether a person is using the same energy as Reiki. In my experiences with those who have a healing skill, all who have gone on to receive the Reiki attunement have told me that the energy they had previously thought was Reiki, was either quite different, or not as strong, or not as easily accessed as Reiki. They talk about Reiki as being a higher vibration, or that it has a different colour, or that it flows through them differently, than what they were previously using. I think the only way to determine if your energy is the same as Reiki would be to receive a Reiki attunement, or to ask a very good clairvoyant to compare your energy to that of a Reiki practitioner. Or you may simply want to sample a Reiki session yourself. This is not to say that Reiki is better than what you are already using. There are indeed other energies that seem to work the way Reiki does, but have a different feel or vibration to them. Yet I wouldn't be surprised if some children are coming into the world now with this energy already flowing - a legacy to our most unusual times. I have found that the most benefit seems to come from a combination of the person giving the energy, the person receiving, the situation, the presence of compassion and Love, and the energy technique. Sometimes a hug is the most powerful technique. "There is a new you every day. Every morning when you wake up you are literally being born anew and afresh. Try new routines each day; see if you can make even the small things more conscious. When you do new things you are conscious and aware of the present moment. You are paying attention, fully alert. Doing new things is invigorating to the physical body." from the book Living with Joy . For several years there have been numerous projects on the effectiveness of Reiki and similar energy based healing techniques. Here are some links to articles, research papers, and current research being conducted. More can be found by searching the internet.